Often when talking about gravity and general relativity the “fabric of spacetime” will be mentioned. This fabric is often visualized as a kind of rubbery sheet that can be bent and stretched by the presence of masses. 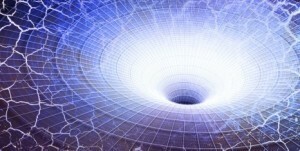 We use this kind of imagery so often that one might imagine that’s actually what spacetime is. 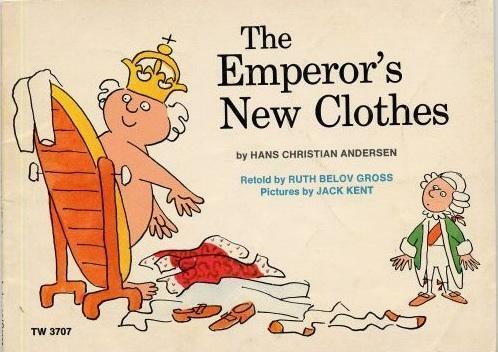 But if spacetime is a fabric, it is the same type of fabric used to make the Emperor’s new clothes. I’ve been teaching introductory electromagnetism this term, and the one thing students often struggle with is the abstraction of it all. We start by looking at forces between charged objects, which is clear enough. But then we talk about how each charge creates an electric field around itself, and other charges interact with that field to experience a force. A nice enough description, but then we shift our focus to the field itself. An electric field can cause charges to flow through a wire, which produces a magnetic field, but a changing electric field can produce a magnetic field without any charges at all. Of course such mutually oscillating electromagnetic fields are what we call light. What started as a mathematical construct for determining the force on a charge becomes a thing in and of itself. Electromagnetic fields are an abstract physical quantity. When we talk about waves of electromagnetism, we often use the analogy of water waves. But water waves travel through the medium of water, while light waves travel through no medium at all. They have energy, but no mass. They have momentum, but no unique force. Most are invisible to human eyes. But despite this abstraction, electric and magnetic fields are taken to exist within the framework of space and time. No matter how abstract electromagnetism seems, it is a thing that exists within spacetime. The order in which events seem to happen depends on your point of view. Which is why relativity can be even more difficult for students to wrap their heads around. We often start with special relativity, where the constancy of light can be used to describe the strange effects of time dilation, length contraction and the like. Even though it’s stressed that this relative behavior of space and time is an inherent property, that even the concept of “now” is relative, many students still imagine a background framework against which all this relative stuff occurs. But in general relativity the last vestige of that background is wiped away. Just as electromagnetic waves travel not through a medium, but on their own, the warps and wefts of spacetime occur not relative to some fixed background, but as an inherent behavior of space and time. This is why masses can curve space without bending it into some higher dimension, and why the universe can expand without expanding into anything. While it helps to imagine spacetime as a bendy-stretchy fabric, just as it helps to imagine light as waves of water, it’s only an analogy to help visualize the complexity of space and time. This sometimes raises the question as to whether space and time are physical quantities. It’s an idea that’s been argued about for years. On the one hand, spacetime has no mass, energy, or momentum, and can only be quantified by observing the behavior of other physical objects. On the other hand, it is warped by masses, and through gravitational waves can carry energy from one region of the universe to another. Regardless of one’s position on the metaphysics, it is clear that we can describe the structure of spacetime and its effects on light and matter quite well mathematically. Of course this ambiguity is part of the reason quantum gravity can be so problematic, but that’s a story for another time. This is a particularly good article for which well done – very lucid. Agreed, but it begs another 100 pages or more for me. We know that space has “properties” associated with it. We are told: it expands; it is warped by massive bodies; it can be rippled by catastrophic gravitational events; it has a temperature; it has intrinsic vacuum energy; it creates particle pairs out of “nothing”; it is intimately linked with time; it stretches light wavelength as it expands; and it possesses a constant universal speed limit. Yes, Kenny. Another 100 pages would be welcome! I agree about the extra “100+” pages. However, just coming into the TS discussion, with little more experience than an appreciation of how life-long presuppositions color our communicative perceptions, just sitting here and “listening” and trying to recast my presuppositional framework through your words is work enough at the moment. More of your descriptions of “the” TS is likely my only hope to begin to overcome a lifetime of conceptual intertias. Thanks for pushing this rock, me, down the hill. It looks like it may be a rollicking ride.